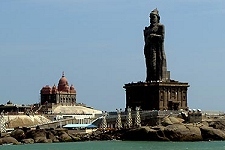 Kanyakumari is a town in Kanyakumari district in Tamil Nadu state, India. Located at the southernmost tip of the Indian Peninsula, it is also know by its former name Cape Comorin. The closest major cities are Nagercoil, the administrative headquarters of Kanyakumari district, (22 km) and Thiruvananthapuram, the capital of Kerala (85 km). Described as the southernmost end of Tamil Nadu, the land’s end of India or the point where the three seas meet, enchanting Kanniyakumari or Cape Comorin is one of the most popular tourist spots in the state. Part of the fascination is of course due to the fact that it is the very tip of the Indian peninsula and the confluence of the Bay of Bengal, the Arabian Sea and the Indian Ocean. Nature is so spectacular at Kanniyakumari that several other Indian beaches pale by comparison. Cape Comorin is at its best during Chitra Pournami (the full moon day in April) when the sun and moon are face to face on the same horizon but other full moon days are also special and you can see the sun set and the moon rise almost simultaneously. It seems as if it is by prior arrangement.Kanniyakumari is 705 kms from Chennai. Kanniyakumari is located at 8°05′N 77°34′E﻿ / ﻿8.08°N 77.57°E﻿ / 8.08; 77.57. It has an average elevation of 0 metres (0 feet). It lies at the meeting point of three bodies of water: the Arabian Sea, the Gulf of Mannar and the Indian Ocean. It is situated at 8° 4′ 41″ N, 77° 32′ 28″ E, and is the terminating point of the Western Ghats and Eastern Ghats. On the north and the east, it is bounded by Tirunelveli District, while on the west and northwest it is bounded by Kerala state. It is suggested that there once existed a continent called Kumari Kandam to the south of Kanyakumari, often compared with Lemuria. Languages spoken Tamil, Malayalam and English.